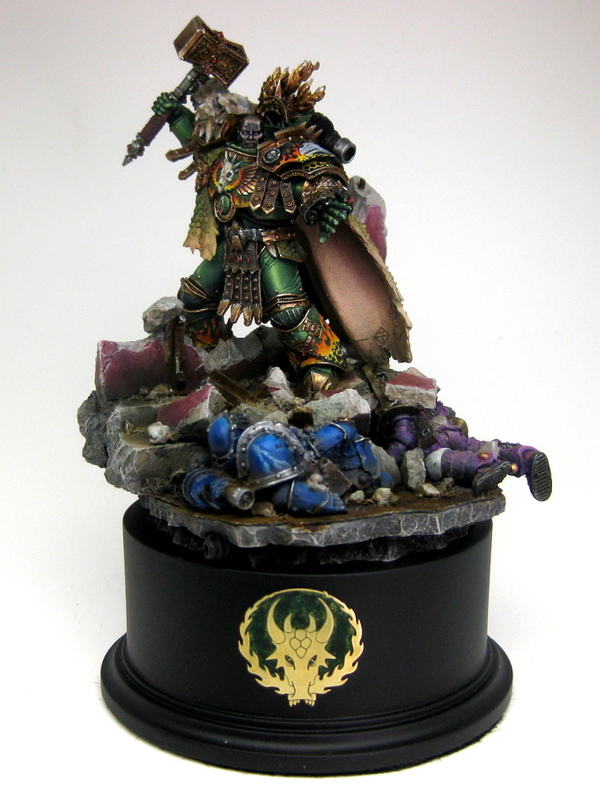 Driving back from my local GW after a Saturday spent painting Imperial Fists and Tracy asked me “Did you post up the photos of Vulkan yet?” and it suddenly dawned on me that despite finishing him over a month ago I had yet to share him here! How very remiss of me! I had mentioned the secret commission that I was working on, and well, this is it! 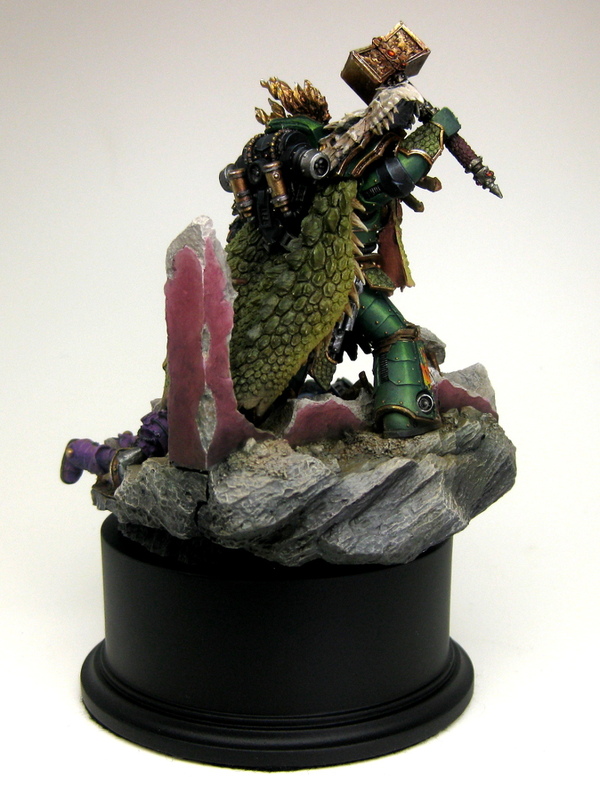 Primarch Vulkan of the Salamanders. Commissions are always a daunting prospect as you are painting for somebody else and painting for a company who will be using your paint-job to promote their business can be a lot of pressure as it is not only your reputation as a painter that is at stake but also the company you are painting for (I take my commissions pretty seriously). However, I have just discovered that painting a commission for a friend can be just as daunting if not more so! Especially if that friend doesn’t want to see any WIP photos or have too many updates for the fear of giving too much away! The first time he wanted to see him was the moment he opened the box! He was a bugger to photograph from some of the angles as the depth of field is a lot more than you would normally get with a single figure, but these aren’t too bad. 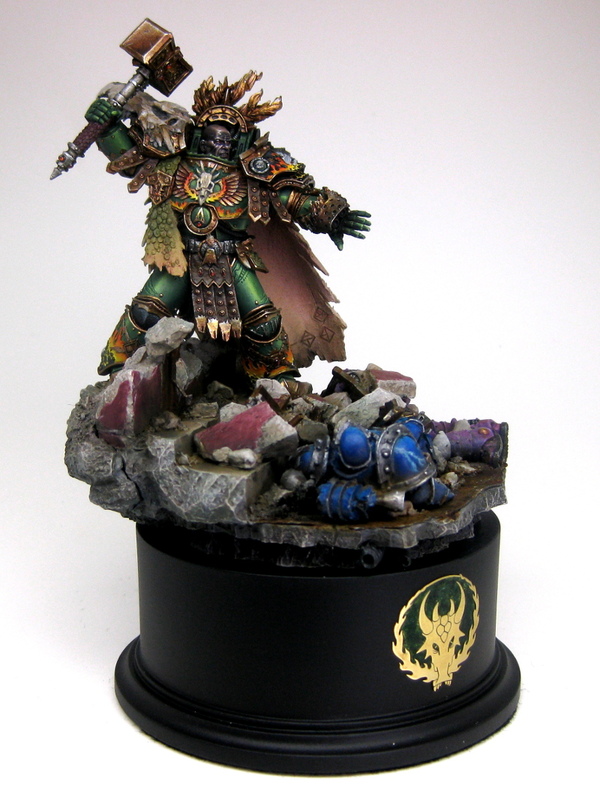 You will also find photos on Putty and Paint and Cool Mini or Not if you are of the voting persuasion – any votes are always appreciated, but comments and critique even more so. Stunning work! The green armour looks especially cool.